Download "Problem Set V Solutions"
1 Problem Set V Solutions. 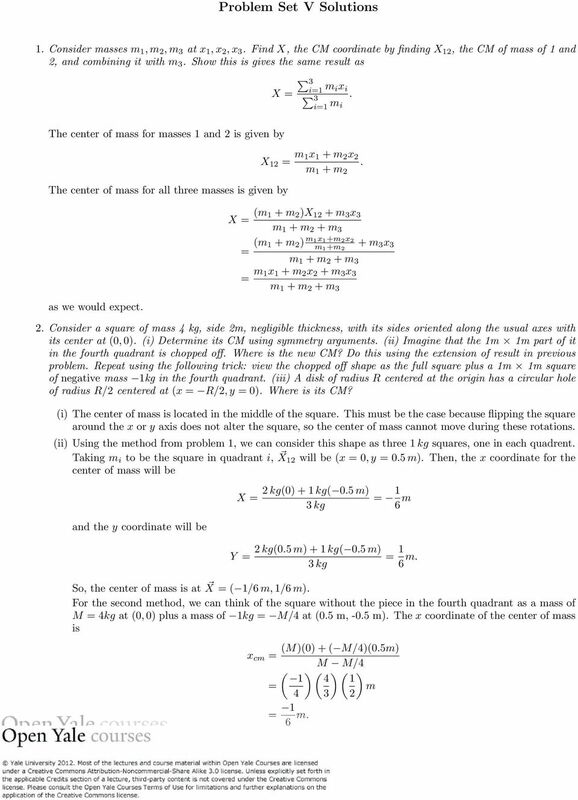 Consider masses m, m 2, m 3 at x, x 2, x 3. Find X, the C coordinate by finding X 2, the C of mass of and 2, and combining it with m 3. Show this is gives the same result as 3 i= X = m ix i 3 i= m. i The center of mass for masses and 2 is given by The center of mass for all three masses is given by as we would expect. X 2 = m x + m 2 x 2 m + m 2. X = (m + m 2 )X 2 + m 3 x 3 m + m 2 + m 3 = (m + m 2 ) mx+m2x2 m +m 2 + m 3 x 3 m + m 2 + m 3 = m x + m 2 x 2 + m 3 x 3 m + m 2 + m 3 2. Consider a square of mass 4 kg, side 2m, negligible thickness, with its sides oriented along the usual axes with its center at (0, 0). (i) Determine its C using symmetry arguments. (ii) Imagine that the m m part of it in the fourth quadrant is chopped off. Where is the new C? Do this using the extension of result in previous problem. Repeat using the following trick: view the chopped off shape as the full square plus a m m square of negative mass kg in the fourth quadrant. (iii) A disk of radius R centered at the origin has a circular hole of radius R/2 centered at (x = R/2, y = 0). Where is its C? (i) The center of mass is located in the middle of the square. This must be the case because flipping the square around the x or y axis does not alter the square, so the center of mass cannot move during these rotations. (ii) Using the method from problem, we can consider this shape as three kg squares, one in each quadrent. Taking m i to be the square in quadrant i, X2 will be (x = 0, y = 0.5 m). Then, the x coordinate for the center of mass will be and the y coordinate will be X = Y = 2 kg(0) + kg( 0.5 m) 3 kg 2 kg(0.5 m) + kg( 0.5 m) 3 kg = 6 m = 6 m. So, the center of mass is at X = ( /6 m, /6 m). For the second method, we can think of the square without the piece in the fourth quadrant as a mass of = 4kg at (0, 0) plus a mass of kg = /4 at (0.5 m, -0.5 m). The x coordinate of the center of mass is ()(0) + ( /4)(0.5m) x cm = /4 ( ) ( ) ( ) 4 = m = 6 m.
4 4 (i) The total momentum is zero, so m 3 v (m + m 2 )V = 0 = V = m 3 m + m 2 v. The boat is moving to the left with a speed V = m3 m +m 2 v relative to the water. (ii) The time it takes the snake to reach P 2 will be the time in which it takes the snake and the boat to go a combined distance of L with the snake moving to the right and the boat moving to the left. where = m + m 2 + m 3. (iii) During this time, the boat has moved a distance L = vt + V t ( ) m 3 L = + vt = t = L(m + m 2 ) m + m 2 v d = V t = m 3 v L(m + m 2 ) m + m 2 v = d = m 3 L or m3 L to the left. (iv) Taking P to be at x = 0 before the snake was thrown, at the beginning of the problem X cm = m 2 L. The simplest way to find the center of mass after the snake is thrown is to again put P at x = 0 and then shift the system by the amount found in (iii). X cm = m 2 + m 3 L m 3 L = m 2 L Since there were no external forces acting on the snake, people, boat system, the center of mass has stayed the same throughout the problem. 6. Find the C of a cone of radius R and height h. (Think in terms of slices of thickness dy at height y.) We know by symmetry that the center of mass of a cone must lie along its axis which runs perpendicular to the base that goes through the point. If we consider a slice of the cone perpendicular to this line, it is a circle with radius r and width dz. Using Figure 2 it is easy to find the radius r in terms in the height z of the slice. We see that h R = z r = r = R z h. The center of mass of each circle is along the axis of the cone, so we consider each circle as a point mass along the axis with mass dm = πr 2 dz/(v olume of Cone). 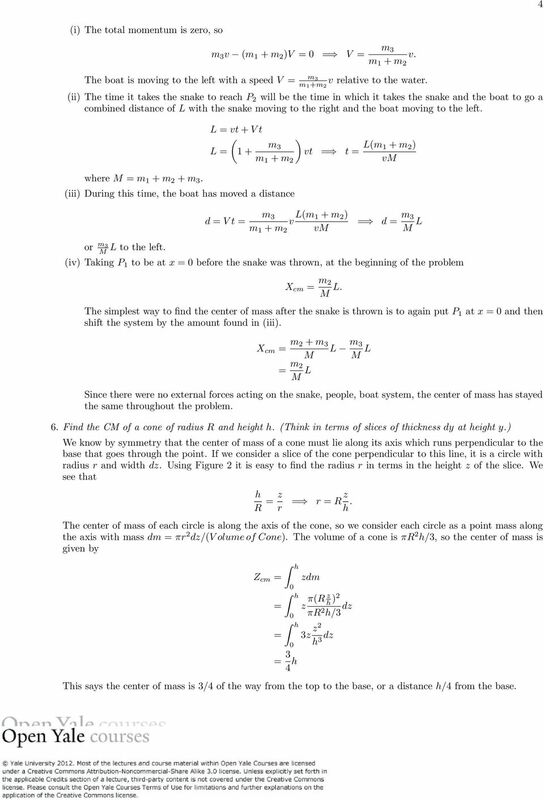 The volume of a cone is πr 2 h/3, so the center of mass is given by Z cm = = = h 0 h 0 h 0 = 3 4 h zdm z π(r z h )2 πr 2 h/3 dz 3z z2 h 3 dz This says the center of mass is 3/4 of the way from the top to the base, or a distance h/4 from the base. 5 7. 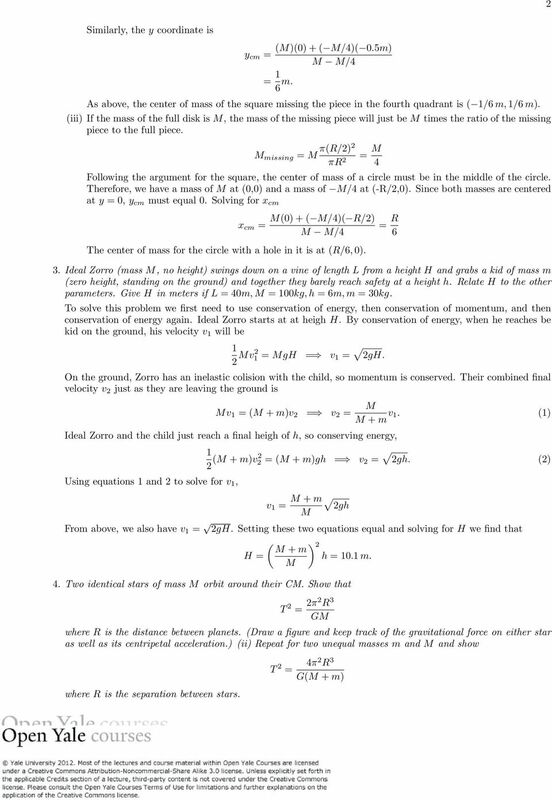 A person of mass = 32.5kg on ice disdainfully throws my quantum text book weighing m = 2.25kg at v b = 2m/s. The book is thrown from zero height and the total distance between the book and the offender is 5.2m when the book lands. At what angle was this excellent book thrown? How fast is the offender moving? Since there are no external forces in the horizontal direction on the person-book system, the x component of the center of mass does not move while the book is in the air. We can use this fact to find how far the book traveled before it hit the ground. X cm = 0 = x b m + (x b x) = x b = x m + where x = 5.2 m is the total final separation of the book and the person. Plugging in numbers, x b = 4.2 m. Take the book to be thrown at and angle α with respect to the horizontal. Then the book s initial velocity in the x direction is v b cos α and in the y direction is v b sin α. In the x direction we know that x b = v b t cos α = t = x b v b cos α. In the y direction, the book starts and ends and the same height so, Plugging in for t, we find 0 = v b t sin α 2 gt2 = v b sin α = 2 gt. 5 (3) sin 2α = gx b 2v 2 b = α = Taking the person s final velocity to be v, we know from conservation of momentum that v = mv b cos α = v = m v b cos α. Plugging in, we find v = 0.66m/s. So, the book is thrown at an angle, α = and the offender has a final velocity of 0.66 m/s. (Note: because of the double angle formula for α, there is a second solution when the angle is equal to 90 α.) 8. Block A of mass m is moving at velocity +v towards mass B of mass 2m which is at rest. To its right and at rest is mass C of mass m. Find the ultimate velocities of all three masses assuming all collisions are elastic. Since all the collisions are elastic, both energy and momentum are always conserved. First consider the collision of block A with block B. Conservation of energy and momentum tell us 2 mv2 = 2 mv2 A + 2 (2m)v 2 B = v 2 = va 2 + 2v B 2 mv = mv A + 2mv B = v = v A + 2v B Solving these equations we find that v A = v/3 and v B = 2v/3. Setting up similar equations for the collision of B with C, 2 (2m)v 2 B = 2 (2m)v2 B + 2 mv2 C = 2v B 2 = 2vB 2 + vc 2 2mv B = 2mv B + mv C = 2v B = 2v B + v C we find that v B = v B /3 and v C = 4v B /3. So, the final velocities for all the blocks are v A = v/3, v B = 2v/9, v C = 8v/9 9. Two identical frictionless billiard balls are symmetrically hit by a third identical ball with velocity iv 0. Find all subsequent velocities following this elastic collision. (Draw a picture at the moment of collision. What does no friction say about direction of forces?) 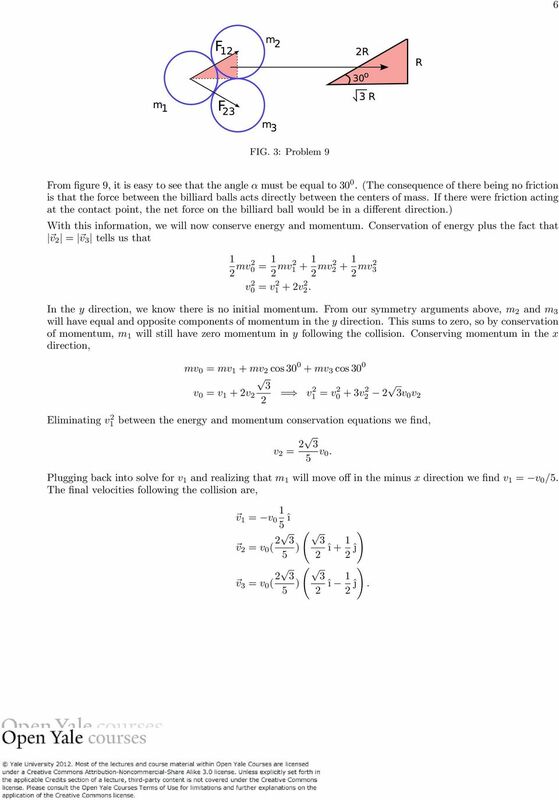 In this problem, both energy and momentum are conserved. However, I will start out by first by using symmetry to simplify the problem. The two balls that are hit (m 2 and m 3, see figure 9) have the same mass. Therefore, the magnitudes of their final velocities must be equal and they move in a direction ±α relative to the horizontal. 6 6 FIG. 3: Problem 9 From figure 9, it is easy to see that the angle α must be equal to (The consequence of there being no friction is that the force between the billiard balls acts directly between the centers of mass. If there were friction acting at the contact point, the net force on the billiard ball would be in a different direction.) With this information, we will now conserve energy and momentum. 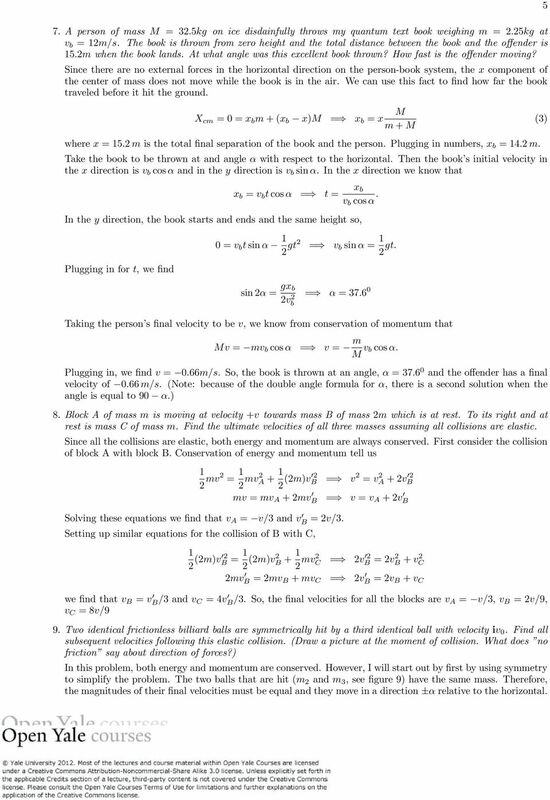 Conservation of energy plus the fact that v 2 = v 3 tells us that 2 mv2 0 = 2 mv2 + 2 mv mv2 3 v 2 0 = v 2 + 2v 2 2. In the y direction, we know there is no initial momentum. From our symmetry arguments above, m 2 and m 3 will have equal and opposite components of momentum in the y direction. This sums to zero, so by conservation of momentum, m will still have zero momentum in y following the collision. Conserving momentum in the x direction, mv 0 = mv + mv 2 cos mv 3 cos 30 0 v 0 = v + 2v = v 2 = v v v 0 v 2 Eliminating v 2 between the energy and momentum conservation equations we find, v 2 = v 0. Plugging back into solve for v and realizing that m will move off in the minus x direction we find v = v 0 /5. The final velocities following the collision are, v = v 0 5 î ( ) v 2 = v 0 ( ) 2 î + 2 ĵ ( ) v 3 = v 0 ( ) 2 î 2 ĵ. Chapter 9. particle is increased. ( ) where W is work, f(x) is force as a function of distance, and x is distance. If all three collisions below are totally inelastic, which one(s) will bring the car on the left to a complete halt? Three-dimensional figure showing the operation of the CRT. The dotted line shows the path traversed by an example electron. = = GM. v 1 = Ωa 1 sin i. A uranium nucleus (at rest) undergoes fission and splits into two fragments, one heavy and the other light. Which fragment has the greater speed? 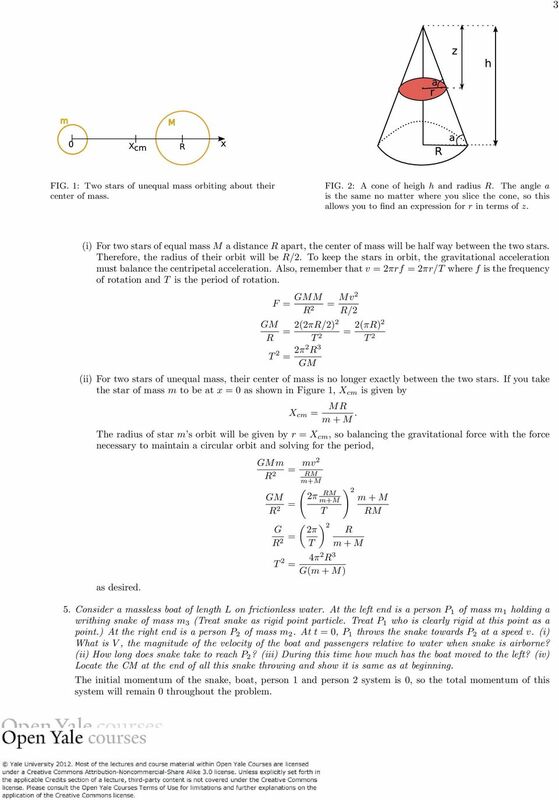 2009 F = ma Exam 1 AAPT UNITED STATES PHYSICS TEAM AIP 2009 2009 F = ma Contest 25 QUESTIONS - 75 MINUTES INSTRUCTIONS DO NOT OPEN THIS TEST UNTI YOU ARE TOD TO BEGIN Use = 10 N/k throuhout this contest.